The Alaska Supreme Court overturned a lower court ruling on Dec. 31, declaring a ballot initiative to ban setnets in certain areas of the state unconstitutional. Calling the initiative a “give-away program” that was designed to appeal to the self-interests of non-commercial fishermen, the court issued an opinion that put an end to a lengthy legal process that began in late 2013. Lt. Gov. Byron Mallott certified the ballot initiative last August after the initiative’s sponsor, the Alaska Fisheries Conservation Alliance, submitted 43,000 signatures in support of the measure, 36,000 of which were declared valid by the Division of Elections. The initiative would have almost exclusively impacted the Kenai Peninsula, where 735 setnet permits are registered alongside a large guided angler industry. Alaska residents hold more than 80 percent of the permits. After the initiative was filed in November 2013, then-Lt. Gov. Mead Treadwell rejected it in January 2014 as an allocative measure, which is prohibited by the Alaska Constitution. RFAA weighed in on the argument in March 2014 supporting the state’s assertion that the initiative was a prohibited appropriation of state resources. At the time, Butler said the idea of banning setnetting at the ballot box was bad policy. “The proposal to ban setnetters is particularly destructive because it doesn’t address the real reasons for declining king salmon populations and would instantly destroy 500 small Alaska family businesses and hundreds of other jobs,” Butler said at the time. The Alaska Fisheries Conservation Alliance released a statement saying its members were disappointed by the decision and referring to the signatures of more than 43,000 registered voters who signed to have the ban put on the ballot. “We are disappointed with the court’s decision to deny voters an opportunity to weigh in on the method and means for harvesting,” said AFCA president Joe Connors in the written statement. When reached by phone Jan. 2, Bob Penney said he was on vacation and had no comment on the decision. AFCA Executive Director Clark Penney, Bob Penney’s grandson, said the group is looking into the Endangered Species Act as another avenue to protect salmon caught by set nets. Clark Penney said the group’s focus was not just on Kenai River king salmon, but on protecting fish species that are targeted by ineffective means. “We see set nets as the least effective for taking their target fisheries,” Clark Penney said. Unlike Pacific Northwest salmon stocks that do have ESA protection, the late run of Kenai River king salmon has never failed to meet its minimum escapement goal. According to the court, commercial setnetters are a distinct user group who would be unfairly stripped of a public resource allocation — their part of the millions of salmon that return to Alaska each year — to another party’s benefit. Most of the members of AFCA are sportfishermen who would ostensibly see more salmon inriver where the commercial nets to be removed from the water; two board members, Connors and Derek Leichliter, are former set net fishermen. Banning setnets, the court wrote in its Dec. 31 ruling, would essentially devote salmon to a specific user group on the Kenai Peninsula, to the exclusion of another. “We concluded that the initiative in question was a give-away program because it was ‘designed to appeal to the self-interests of sport, personal, and subsistence fishers,’ in that those groups were specifically targeted to receive state assets in the circumstance of harvestable shortages,” the court wrote. The court also concluded that the ballot initiative would have narrowed the Legislature’s and Board of Fisheries’ ability to make allocations. Much of AFCA’s legal justification for the ballot’s constitutionality rested on prior ballot initiatives that banned hunting or fishing methods and means. The court said the prior initiatives were either not equivalent to the setnet ban, or that their passage alone didn’t make them constitutionally sound. AFCA attorney Matt Singer had argued Alaska has a history of making resource-related ballot initiatives, such as aerial wolf hunting and bear baiting. The Supreme Court said the argument is invalid, as the user groups for salmon are more clearly defined. Singer had also argued that Alaska voters banned fish traps by voter initiative, which he said established both gear type restrictions and the resource as fair game for ballots. Indeed, voters did outlaw fish traps by ballot initiative in 1959. The Alaska constitution, however, had not been accepted at this point. “Ordinance 3 was approved before the Alaska Constitution went into effect and was thus not governed by the constitutional prohibition against appropriating by initiative,” the court wrote. Even subsequent resource initiatives are not equivalent to the setnet ban, the court ruled. Singer had cited several cases as evidence of the ban’s constitutionality. Two of these ballots, however, were held before salmon had been ruled a “public asset,” and therefore forbidden under the Alaska constitution’s ballot measure provision. Several of the fishermen who weighed in on the Supreme Court decision said they are weary of Cook Inlet’s “Fish Wars.” But each blamed fishermen from opposing user groups for igniting tension between user groups. Butler said Resources for All Alaskans and the commercial fishing community didn’t want a fish war. “We’ve existed in this community for 100 years. The concept of a fish war is new and it’s because of increasing demand and we need to talk about that because there are plenty of fish for everybody. We just need to cooperate and not put people out of business to accomplish that goal because there’s no need to,” he said. 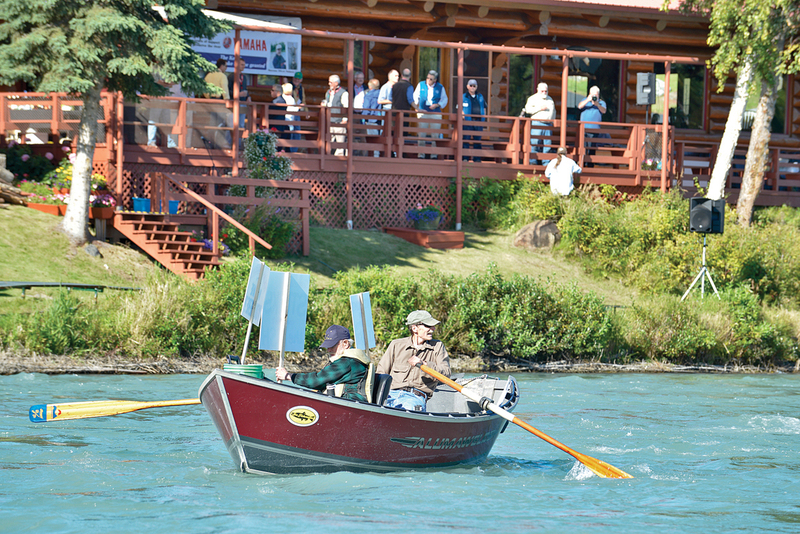 Connors, who is the President of the AFCA board as well as a fishing charter and lodge owner on the Kenai River, said he saw inflexibility and an unwillingness to change from many commercial set net fishermen in Cook Inlet. Butler said he believed the people who spearheaded the effort to ban set nets in certain areas of the state would continue their fight. Despite his frustration with the set-net fishery, Connors said he saw promising changes being made by commercial set net fishermen in the Cook Inlet. He referenced large operations — like Gary Hollier’s family sites where more than 20 nets are typically in the water, or Greg Johnson’s family sites where 18 nets are typically fished. Both families cut nets on some or all of their sites to shorter depths in 2013 in an effort to reduce harvest of king salmon. Connors also spoke highly of Brent Johnson, who owns another large family operation in Clam Gulch, and Brent Johnson’s “selective harvest modules,” which are designed as a type of fish wheel that, in theory, allows Johnson to keep fish alive long enough for him to release those he did not intend to target. Connors said he is encouraged by those efforts to change the way set net fishermen target salmon. Many fishermen said they hoped a more fruitful dialogue between user groups could happen now that the threat of a ban had been lifted. Snug Harbor Seafoods Co-owner Paul Dale, president of the Alaska Salmon Alliance — a fisheries trade organization representing seafood processors and commercial fishermen on the Kenai Peninsula — said it had been difficult to have constructive conversations with users who wanted to abolish his way of life. “Who wants to negotiate when someone is holding a gun to your head? It really stymied dialogue between commercial and sportfishing,” Dale said. Connors said negotiations between the two groups had been difficult long before the initiative process began. Despite their misgivings, Connors, Dale and Butler all said they hoped more normal dialogue could resume among competing user groups in the Cook Inlet. “We are so fortunate and so blessed to have this tremendous resource, the notion of a war is appalling if you think about it,” Butler said. DJ Summers can be reached at [email protected]. Rashah McChesney can be reached at [email protected].